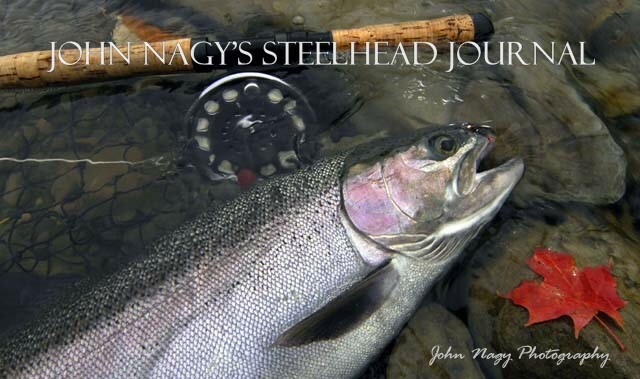 Please feel free to browse the side bar which has information on myself, the new 4th edition of Steelhead Guide, instructional Lake Erie guide trips (both nymphing style and traditional presentations), upcoming feature fly fishing magazine articles and helpful steelhead tips. I also offer cutting edge steelhead tackle (including my unique "Noodle" fly rod design), hot steelhead flies (steelhead egg patterns, bead-head nymphs, wooly buggers and streamers) as well as my signature tube fly patterns. Look for timely fall, winter and spring Lake Erie steelhead tributary fishing reports and pictures posted on the Steelhead Journal as well as important news items concerning the Lake Erie tributary steelhead fishery. 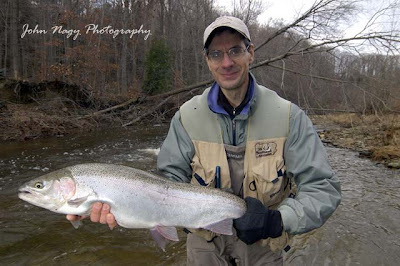 Please enjoy the steelhead photography on the Steelhead Journal. My photography is very important to me. 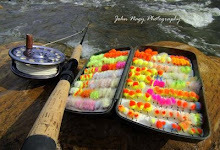 My images I try to capture the essence and subtleties of the sport of steelhead fly fishing in the Great Lakes. All photographs are for your personal viewing pleasure only. Please contact me if you are interested in any of my photographs. My passion for steelhead fly fishing over the last 20 years can be best summed up by the quote taken from Roderick Haig-Brown's 1946 classic book "A River Never Sleeps". 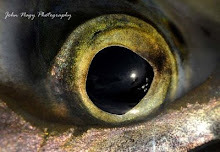 "But the Steelhead, with the brightness of the sea still on him, is the livest of all the river's life. When you have made your cast for him, you are no longer a careless observer. As you mend the cast and work your fly well down to him through the cold water, your whole mind is with it, picturing its drift, guiding its swing, holding it where you know he will be. And when the shock of his take jars through to your forearms and you lift the rod to its bend, you know that in a moment the strength of his leaping body will shatter the water to brillance, however dark the day." When pursuing steelhead on the Great Lakes tributaries, please respect your fellow steelhead fisherman, the rights of the private landowner and the magnificant steelhead itself. This can only result in a better overall experience for all.